E.E. Cummings said, “The most wasted of all days is one without laughter.” He is someone that would be fun to sit and visit with on the patio. So, grouchy people need to work alone and not have anything to do with customers. That’s tough to make happen. But we can decide not to be grouchy. It is true. I know it is because I see people who blame all sorts of things and people for their bad attitude, but then there are lots of people who have worse problems that don’t have bad attitudes. So, it’s in the decision on whether you’re going to be a grump or not. Look up Shaquem Griffin. A recent Sports Illustrated magazine featured him as a “Best Inspiration” article. As a very young boy he lost a hand. And yet he is a leading college football player in the nation. The article said, “Shaquem hated hearing excuses. ‘A lot of people in our generation like to make excuses about little things that really don’t hinder them from doing what they want to do,’ Griffin says. ‘It always comes down to the work ethic. God put you on the earth for a purpose. I feel like my purpose is to get away from people making excuses.’ That’s why Shaquem declined a disabled parking permit even though he’s eligible for one. All this means we need to start being more positive and have more fun. And we need to quit making excuses for not doing so. A couple other things to put on the “Quit List” are to stop trying to please everyone, stop fearing change, stop living in the past, stop putting yourself down, and stop overthinking. Lots of things for us to work towards. But remember, according to Shaquem, who puts us all to shame, it’s all in the work ethic. Let’s work on it. A couple of excellent working groups that have things coming up you might enjoy is TCEC and the Guymon Lions. On Thur., Jan. 11, during the lunch hour, noon to 1, go by Charles White Insurance at 1024 N. Main Street for the Co-Op Connections Spotlight. You can sign up for the drawing for $100 in Main Bucks. 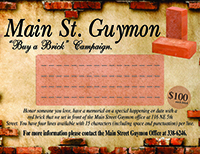 You can spend your Main Bucks at Beauty and the Beast, Bob’s Cowboy Bar, Chamber of Commerce, Cheryl’s Quilt Corner, Christine’s Home Furnishings, Dancers, Dizzy Bs, G & G Electronics, GABS Liquor Store, Garrison Insurance Agency, Golden Crown, Guymon Furniture, Harana MedSpa, Helm’s Garden Shop, Inspirations, Lumber Mart, Maddox Farms, Merle Norman, Mitchell Theaters (Northridge Cinema), Panhandle Pest Control, Pub on the Bricks, Reid’s Furniture, Roberts and Keenan, SPC, Top Value Grocery Store, Urban Bru, Whispering Bliss Boutique, Willows Inn, Wirtz Lumber, Wolf Creek Mini-Mall. The Co-Op Connections Spotlight is done by TCEC, highlighting the deals you can get through the program. Go see all the opportunities by visiting www.TCEC.coop. The Lions Chili and Stew Supper is Jan. 16 at the Methodist Enrichment Center, 6th and Quinn, from 5:30 to 8:00 pm. The cost is $7 for an adult, $5 for kids from 5 to 8 years old and free for kids under 4. And don’t miss out on the homemade pies! Lots of fun to be on the bricks!